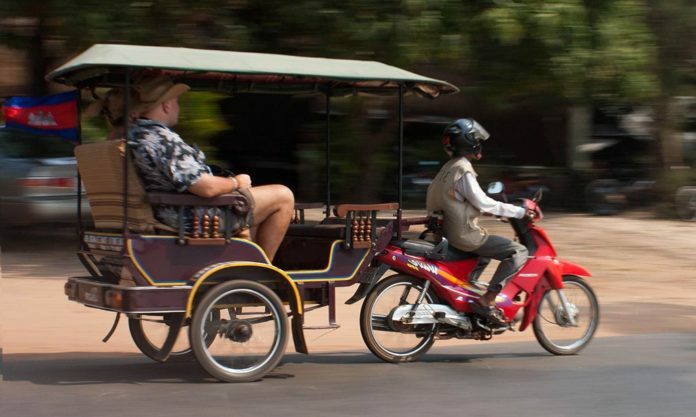 A tuk-tuk (remorque) is the most popular way to get around the Angkor Archaeological Park. - Photo by Judith. The Angkor Archaeological Park, designated a UNESCO World Heritage site in 1992, is spread out over 400 square kilometers. To properly and comfortably navigate these striking temple ruins, visitors should be aware of the available transportation options to get to and around the park. Taxis provide air-conditioned comfort and can be hired for more than one day if needed. However, it is also an expensive choice, costing between $20 and $30 per day. Additional fees are added for trips to temples off the main circuit such as Beng Mealea and Banteay Srey. Visitors should also be aware that there is less freedom to explore the areas in between the temples using taxis. With off-road capabilities and an environmentally sensitive battery powered by the sun, the electric car is something to consider. A driver is included in the rental price of $80 to $90 daily. This price includes a surcharge for the taxi plus tariffs levied depending on which temples will be visited. This open air safari-like vehicle is quiet and a great choice for your visit. Motodops are motorbikes on which visitors sit behind the hired driver. A driver is necessary because tourists are not allowed to drive motorbikes or cars in Siem Reap. Less expensive at $8 to $12 per full day rental, the motorbike can reach areas that taxis cannot, but additional charges are added for travel to the distant temples. Also be aware that sitting on the back of a motorcycle is probably the least comfortable way to get to and round the Angkor Archaeological Park. Remorques, more commonly referred to as tuk-tuks, are by far the most popular way to travel around the park. These covered trailers, pulled by a motorized bike with driver, provide protection from the sun while allowing visitors an unobstructed view of their travel. 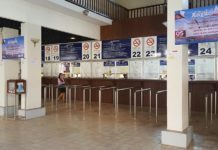 Like the motorbikes and taxis, drivers must be licensed and wear identification when entering Angkor. Costing $10 to $15 per day, with additional charges for outlying temples, this is a great way to explore the ruins in comfort. Some friendly drivers, many of whom speak English, can provide factual information about the temples and other areas of the park. While bicycles are a very inexpensive transportation choice and a great way to navigate all corners of the park, visitors should consider a few things before deciding to rent one. 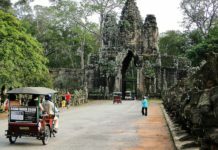 The main entrance to the park, where admission passes must be purchased, is approximately 5 kilometers from the center of Siem Reap. Temperatures can be quite high, so renting a bike should be done early in the morning. Lastly, if you do choose this option, be sure that the bicycle is well-made and strong to avoid any travel issues. A unique way to see the park is from the air! Tethered helium balloon rides are available at the park. Rise above these amazing ruins and view the surrounding area also. Visitors should bring binoculars for this trip. Those who prefer to fly around the ruins have two options. 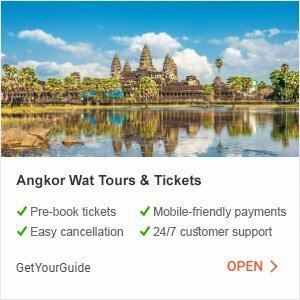 Helicopter rides around Angkor Wat and outlying temples can be arranged. The cost varies based on individual or group rates and the specific tour selected for an 8 to 14 minute ride, but the view is unforgettable. Visitors may also board a microlight aircraft (or ultra light aircraft) for a 30 minute tour of the park or extend the ride to an hour which includes other Cambodian sites. Aircraft are not permitted to fly directly over the temples but can cruise the perimeter of the park providing incredible views. The Asian elephant is held in high regard in Cambodia. Unfortunately, in 2016, an elephant named Sambo collapsed and died after taking tourists on a ride to the Bayon Temple. There were immediate calls to end the elephant rides there, and an online petition was launched. 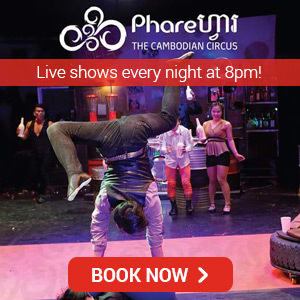 Although these controversial rides still exist, elephant lovers may instead spend some time volunteering at the Elephant Sanctuary (Save Elephant Foundation) located 100 kilometers north of Angkor. Here, plans are in the works to preserve nearly 25,000 acres of land for wildlife, including elephants, and restore the natural forestation required. 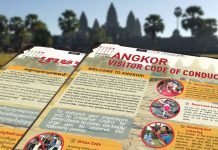 Visitors to the Angkor Archaeological Park are well advised to wear light long-sleeved clothing and pants to protect from the sun’s strong rays. Hats, sunglasses and a krama, a Khmer scarf, are also recommended. Shoes should be comfortable and practical. Sunscreen and mosquito repellent may come in handy. Serious explorers may want to bring a flashlight and compass. Tour guides can provide detailed information about the temples not found in guide books and cost approximately $25 dollars a day. Visitors can make arrangements for tour guides and many of the above modes of transportation through their guesthouses. In all cases, settle on the exact cost of your selected itinerary in advance. Be specific about what you want to see, especially if some of the more distant ruins are in your plans. Sunrise and sunset visits are also options that must be planned for in advance. This will avoid any miscommunication.